Egyptian Officials Warn Hamas Leaders: "Israel Will Retaliate and Destroy You and We Won't Do a Thing to Stop It"
"Just so you know," they leveled at Hamas leaders Yahya Sinwar and Ismail Haniyeh, "if Israel decides to launch a comprehensive military operation in Gaza, we won't do a thing to stop it, even if it decides to simultaneously topple Hamas and conquer the Gaza Strip." "The atmosphere at the start of the meeting was very relaxed and cordial," the Egyptian official said. "A short while before the meeting, we had returned from Israel with answers. We believed Hamas would accept them, and facilitate a more stable and long-term ceasefire. A few minutes later, an assistant to the Egyptian delegation entered the [meeting] room with a worried look on his face and handed the Egyptian delegation leaders his cell phone. "The smiles were immediately replaced with grim faces; the delegation heads turned to Sinwar livid and told him: ‘How far do you think you will get with this double game of yours? We are sitting here to hammer out the details of a ceasefire with Israel and behind our backs, you are authorizing your people to fire missiles at Tel Aviv?'" 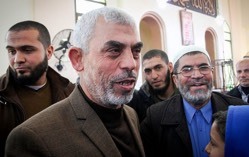 "Hamas is not behind the launch," Sinwar reportedly told his Egyptian guests, adding that his organization would conduct a thorough investigation to find those responsible. Sinwar asked the Egyptian officials to contact Israeli leaders and inform them that no order had been given to fire rockets at Israel—and certainly not at Tel Aviv. The Egyptian intelligence officials were unconvinced and continued to assail Sinwar. "You are lying! The blood of Gazans who will be hurt in the Israeli response is on your hands! By your own hands, you will bring about the destruction of Gaza and the fall of your regime, and you've also gambled with our own safety in Gaza by shooting at Tel Aviv while we are here!" The Egyptian official added: "A short while after we left the Strip, Sinwar contacted the delegation heads and told them that Hamas operatives carrying out maintenance duties near the launch batteries placed in western Gaza, in preparation for a future clash with Israel, apparently fired the missiles mistakenly. According to Sinwar, Hamas detained one operative, and promised to detain others and bring them to justice."